After my first few hikes on the FLT I decided that I wanted to complete the entire trail; an end-to-end (E2E). I knew that it would take me years to complete the entire trail, so by the end of my second year of hiking, 2011, I added some short-term goals to accomplish along the way. I wanted to do an overnight hike and I also wanted to try to hike a “marathon”, 26.2 miles, in a single day. My first overnight hike would wait until September 2013, but I had already started increasing my mileage in 2011. My first 20+ mile hike was June 2011 at 21.82 miles, and the next in July at 24.57 miles. Although, that was an unplanned distance and I was left hurting after. 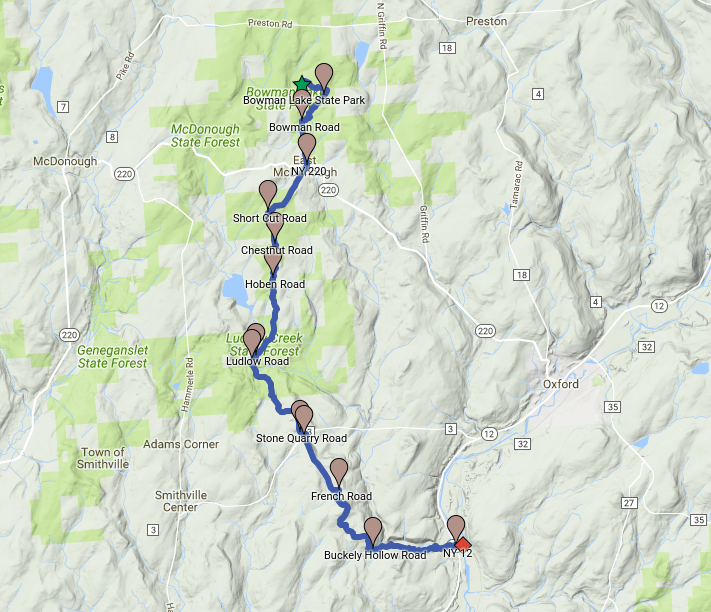 During the cold winter months of the beginning of 2012 I began planning; I decided I would do my marathon hike that year. I knew I needed to build up my endurance and distance so I would need to keep increasing my mileage with each hike. My first hike in 2012 was my “warm-up” and was only 16.23 miles. The next hike in May I increased the mileage to 21.18 and then 24.38 in June. I was ready. Author’s note: You may notice that after my lunch stop I did not include time with the mileage information. This is because the GPS track was not saved correctly and I lost all the timing data. I had to derive the time from my photos and add it to those specific points on the GPS track. I did not take any additional photos after my lunch stop. My marathon hike began at Bowman Lake State Park. I arrived at the park in the early morning. It was quiet and still. Dew had dampened the ground overnight. I parked in a lot above the lake, pulled on my boots and pack, and started up the park road toward the entrance that I had just driven through. The sun was beginning to peek above the horizon and I could see it glowing through the trees. I turned toward the entrance to the park and continued out the gates and down the road. At the intersection of Bliven Sherman Road, just beyond the entrance to the park, I turned right and continued on down the road. It turned from a paved road to dirt shortly and began to curve to the right. As I rounded the corner I lost sight of the park entrance behind me and came to the trailhead (mile 0.6 – 6:24 am). I left the road and entered the woods. 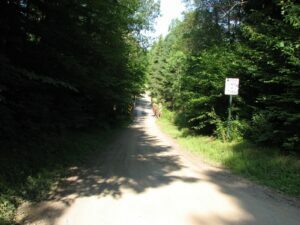 Soon after I came to Bowman Road, a seasonal dirt road (mile 1.3 – 6:42 am). I turned left and followed it down to cross NY 220. As I came to the intersection of NY 220 I saw some chickens walking around in front of the house on my left and heard a dog barking at my arrival. The sun was already warming the air and there was the slight haze that often comes with the morning of hot summer days. The forecast was for temperatures to rise into the mid-to-upper 80’s; it was already near 70. 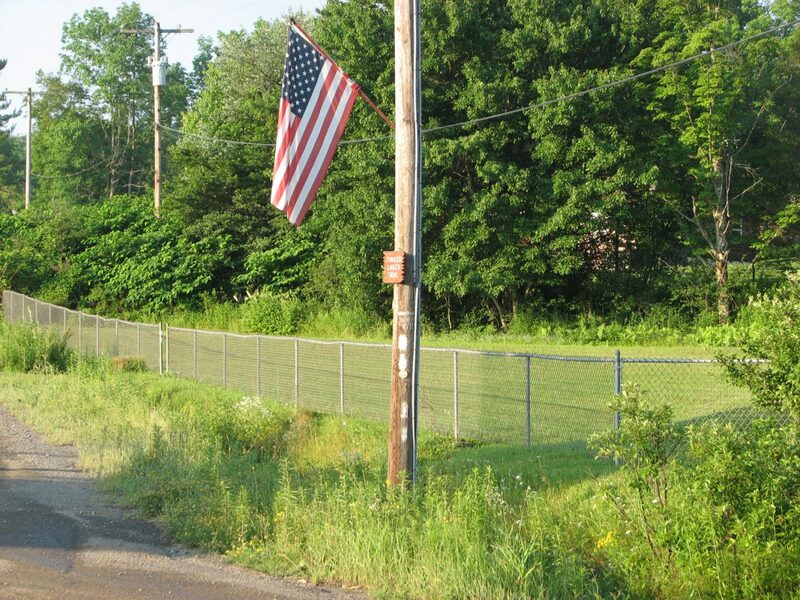 I crossed NY 220 (mile 2.1 – 6:57 am) and saw a double white blaze on a power line pole with an American flag. A double white blaze indicated a turn, but I did not see where the trail went at first. I looked around and then saw ahead of me an opening in a chain link fence around a playground that also had a double blaze. I turned through the fence and found the trail entered the woods farther along inside the playground. It followed a narrow dirt road. I followed the dirt road along as it climbed up a small hill heading in a straight line. Shortly after passing near the top of the hill the road crossed a power line right-of-way. The dirt road turned to the right and continued on straight ahead. After a short distance the trail turned left off the road and began to follow another small dirt road. This road had been frequented by ATVs and dirt bikes and was rutted and rough in many places. There were several spots where water had filled into the ruts and I had to pick my way around. I reached Short Cut Road, another small seasonal dirt road (mile 3.3 – 7:24 am). I crossed and hiked a short distance before coming to Chestnut Road, yet another dirt road; although this one was wider and looked more traveled (mile 3.9 – 7:37 am). After crossing Chestnut road I had another short hike and came to another road, Hoben Road, again another small dirt road (mile 4.5 – 7:51 am). As I crossed Hoben Road I looked to my left and could see bright sunshine. It looked like the tree cover opened up a short distance up the road. I crossed back into the woods and continued on. After a longer walk I came to Ludlow Road, yet another dirt road! (mile 6.1 – 8:37 am) The trail turned left onto the road and then after a short distance came to the intersection of Tucker Road where it turned right and descended quickly across a one-lane bridge over Ludlow Creek. Once across the bridge the trail turned off the road to the left and crossed over a deep ditch on a pair of springy boards (mile 6.2 – 8:42 am). The trail followed along a wide path over mostly level terrain for over a mile. Then it began to turn to the left and started an easy climb up over a small hill. The trail turned to the right and crested the top of the hill. Soon after leaving the hilltop behind it opened out into a field. I followed down along a hedgerow, came to another hedgerow, and crossed into the next field. Ahead of me I saw a small barn and beyond it a house. The blazes continued to direct me down along the edge of the yard and past the house. Even though the trail was marked I still felt a little odd about walking through someone’s yard. I stepped out onto Stone Quarry Hill Road (mile 8.1 – 9:23 am); dirt, but this time oil and tar had been put down. I looked back and saw a handwritten sign posted on a small tree next to an FLT sign; “FLT Parking on the Grass” it read. It seemed that the owner of the house was a fan of the FLT. I turned left and headed down the road. A short walk and I came to CR 3, for a change a paved road with a double-yellow line down the middle. I crossed to the opposite side and walked up the road a short distance before coming to the intersection of Fred Wilcox Road (mile 8.3 – 9:28 am), also a paved road, but with no center line. I turned left onto Fred Wilcox Road and began a long road walk. It was getting hot with the sun beating down on me and I tried to walk in the shade where I could. Fields opened alongside the road periodically and a few houses looked out on to the road. I passed by a radio tower as I walked along. The road seemed to go on and on. Some time later I saw a red barn in the distance beyond a small swamp filled with cattails. I stopped in the shade of a tree to take a picture and get a break from the hot sun. After passing the barn I reached a sharp left turn in the road and it became French Road. I continued on around the corner and shortly after passed an intersection with Hattie Clark Road. Just beyond the intersection the pavement ended and the road turned to dirt and the trail turned right off the road (mile 9.5 – 9:51 am). The road walk from Stone Quarry Hill Road to the French Road had been nearly 2.5 miles. I was ready for a break and took my pack off and sat in the shade to drink some water and eat a snack. After resting for a short time I started out again. The trail climbed over the top of a small hill and then descended quickly down the other side. After the quick descent the trail continued to descend gently through the woods. I came upon a small bird perched in a tree and paused to take a picture. Soon after I came to an old field, now overgrown. It presented a great view of the hills in the distance to the south. I crossed along the top of the field before heading back into the woods. 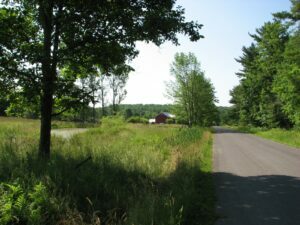 The trail turned to the right and I soon arrived at the triangular intersection of Buckley Hollow Road and Williams Road (mile 11.3 – 10:47 am) . Once I was across the roads I passed along the edge of another small field. 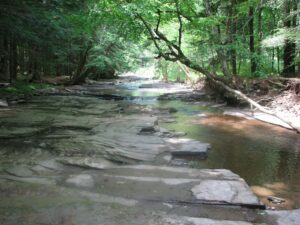 I returned to the woods and the trail turned to follow along Ludlow Creek; the same creek I had crossed over on the one-lane bridge on Tucker Road. After an easy walk I came to another old field and saw a path leading down to the creek on my left. I thought it might be a nice place to stop for lunch on my way back. 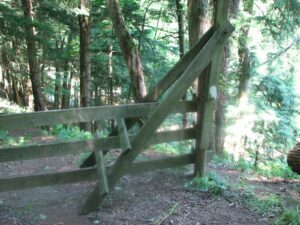 Just beyond the old field I came to a stile and climbed over. On the other side was a large field still in use. I followed along around the edge. At one place I encountered a steep drop-off to a road below; the side of the field had been dug into from below. After passing the drop-off the trail turned to the left through some trees and opened out onto the busy NY 12 (mile 13.0 – 11:30 am). I turned left and crossed to the opposite side of NY 12 heading for the intersection of S. Oxford Bridge Road just a short distance ahead. I turned right onto S. Oxford Bridge Road and continued on down the road. At the end of a field to my left I came to my turn-around point (mile 13.2 – 11:35 am). I looked around for a good parking area for my next hike when I would start from this spot; The shoulder of the road was wide and I could park there. I turned back and headed toward NY 12. After crossing to the opposite side of NY 12 I made the short walk to the trailhead and climbed back up to the field. 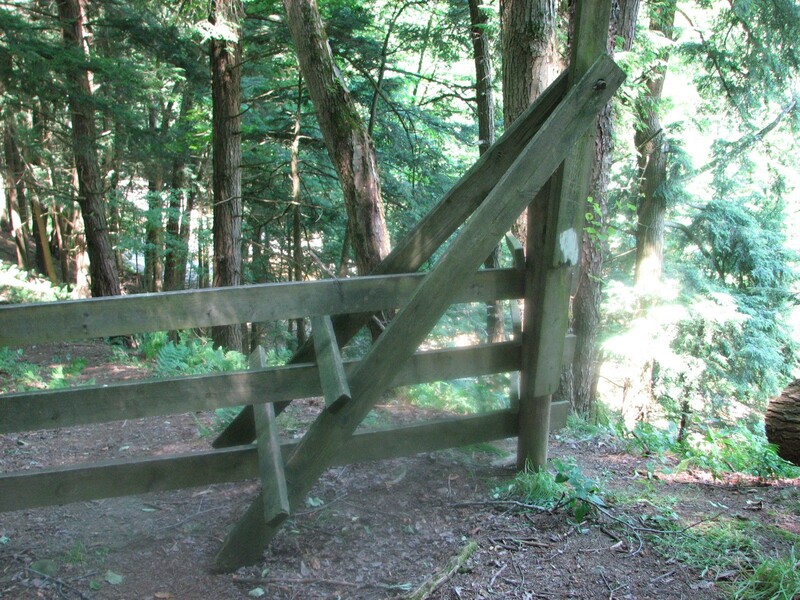 I followed the field along past the drop-off and back to the stile. After climbing over I came back to the small old field and turned on the path down to the stream (mile 13.7 – 12:12 pm). 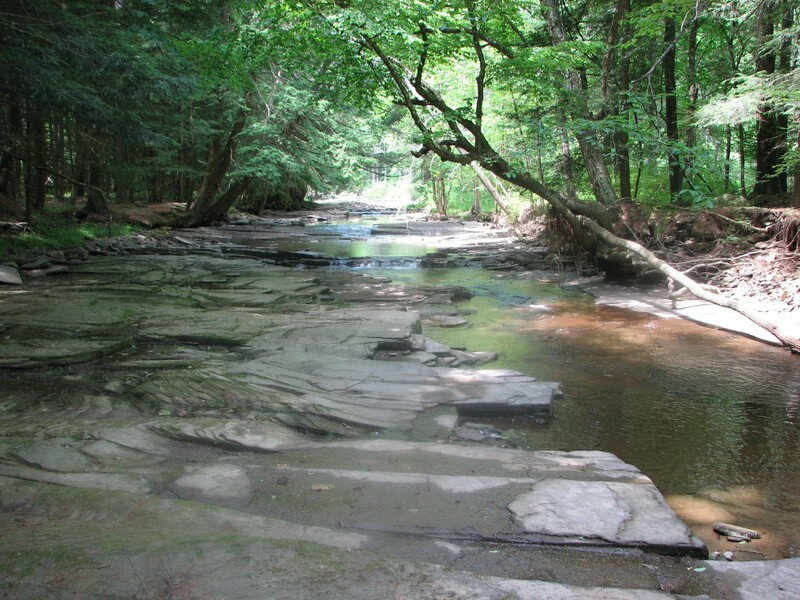 It was a perfect area for a lunch stop; there were several large flat rocks in the stream that I could sit on. I dropped my pack and pulled off my boots and socks. I let my feet dangle in the cool water while I ate; it felt very refreshing. After finishing my lunch I relaxed for a while longer and walked along the rocks to take some pictures of the stream. Finally I had to get moving again. I dried my feet off and pulled my socks and boots back on. To help keep me a little cooler I dunked a small towel in the cool water and hung it over my neck. Then, I headed back up to the trail from the stream and turned right to head back to Buckley Hollow Road. I crossed Buckley Hollow and Williams Roads (mile 15.3) and began climbing back toward French Road. My shoulders were beginning to hurt from the weight of my pack. I stopped and pulled a couple small towels out and placed them under the straps on my shoulders as padding. By the time I reached French Road (mile 17.0) the cool wet towel I had placed around my neck at the stream was now warm and only slightly damp. I removed it and hung it on the back of my pack. I turned onto French Road and continued on up Fred Wilcox Road. It was hot on the pavement and I was getting tired, but I still had a long way to go. I finally arrived at CR 3 and crossed over before turning up Stone Quarry Hill Road (mile 18.5). I walked up along the yard next to the house, still feeling a little odd about it, and then on up through the fields. The trail wound along through the woods heading back to Tucker Road. Thankfully the trail was mostly level and easy to walk. I reached Tucker Road some time later and turned right onto the road (mile 20.4). There was a short climb on the other side of the bridge up to Ludlow Road. Even though it was just a short climb I trudged slowly up the road, tired and hot and aching. I left Ludlow Road and continued on to Hoben Road (mile 22.2). The trail climbed gently on past Hoben Road and then across Chestnut Road before cresting a small hill near Short Cut Road. I crossed over Short Cut Road (mile 23.4) and turned back on to the straight dirt road that led back to the intersection of NY 220. Once across the power line right-of-way the trail started to descend to NY 220. I emerged from the woods in the small playground. The sun was getting lower in the sky and the air was warm with the scents of a summer evening. 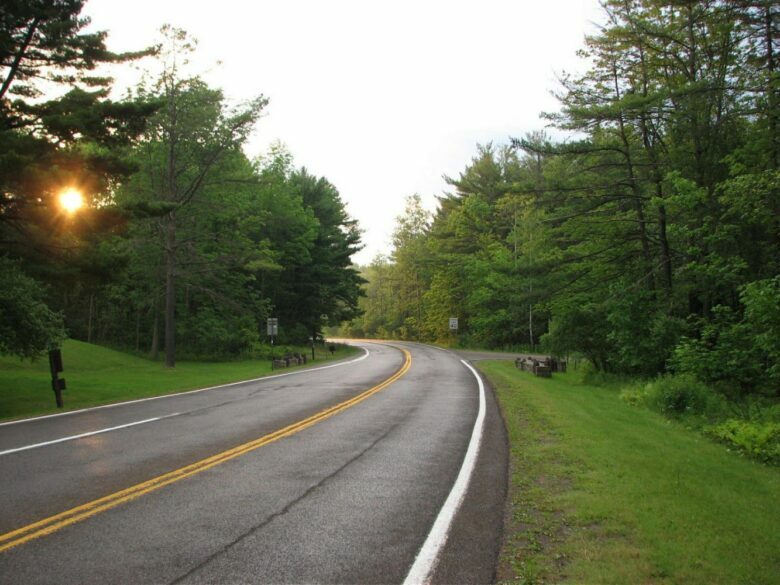 I crossed NY 220 (mile 24.5) and headed up Bowman Road. My feet hurt with every step and my shoulders and back were sore, but I was close and that energized me. I continued on up the road until I reached the trailhead and then turned into the woods. A short walk later, although it seemed much longer, I was back on Bliven Sherman Road (mile 26.2) and heading toward the entrance of Bowman Lake State Park. I passed through the gates and headed down the park road to my car. There were more people around now; couples walking and families picnicking. I was thankful that the last short walk to my car was a gentle downhill. If I had any energy left I would have sprinted to my car, but it was all I could do to put one foot in front of the other. I arrived at my car nearly 12 hours after I had started my hike and I was exhausted (mile 26.88 – 6:11 pm). I tossed my pack into the car, pulled my boots and socks off and traded them for sandals. The beach area was a good walk away and I was done walking. I started my car and drove around to the beach-side parking area. I got out and walked right into the water, it felt great. My marathon hike was complete. I later learned that the section I had chosen to do the hike was perhaps the best one to do it on. It only averaged less than 88 feet of climb per mile, one of the easiest sections I would encounter until the eastern end of the FLT which was mostly road walk. In comparison, the ruggedest section was the one I chose to hike for my first overnight hike (with a heavier pack); it averaged 260 feet of climb per mile. Nice account of your hike with pictures. I paid highly for 20-plus mile days on my other hikes along the PCT, CDT and AT. Blisters were almost guaranteed, even after the first 1000 miles (when you would think your feet were toughened up). My last day on the PCT I did 40 miles. That was a “before dawn” to “after dusk” hike. Never again. My toes were literally weeping (with lymph) at the end. And yet, I read where the AT’s latest speed hiker with support did 83 miles one day. I can’t even comprehend that. The 20-ish mile hikes I don’t find that bad anymore. This past year all 5 of my hikes were around 20. However, after this hike, I said I had no desire to do another. I can’t comprehend 40 miles, let alone 83. I had read that account as well and was absolutely amazed at the speed/distance he covered.